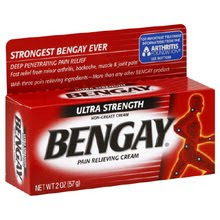 There is a new very high value Bengay coupon available right now. To get this coupon just register with Bengay and you will be able to print a coupon to save $5 off any Bengay product. Walgreens carries some Bengay Pain Relieving creams for $5.99 regularly.Walmart or Target may have them cheaper, or you could hang on to it and see if they go on sale. Either way you can score some cheap or free Bengay!